Picture the scene: a massive ice and snowstorm hits the Southeast. Road are frozen, cars are trapped. This includes the car of Atlanta Braves first baseman Freddie Freeman. If you’re Freddie Freeman, trapped in your car on the frozen interstates around Atlanta on January 28, 2014, what would you do? Who would you call? Well, you’d call Chipper Jones, today’s birthday boy, of course! ed a tweet about being trapped. Without being asked, without being sought, Chip-man rode to the rescue. On an ATV! Upon reading the tweet, Jones set out to rescue his friend and former teammate. This picture was captured and immortalized on Twitter by Jones’ then-girlfriend when they got safely back to the house, 11 hours after Freeman had left home. Chipper Jones is an all-star at ATV snowstorm rescues. Many people have been immortalized in bobblehead form: Ichiro Suzuki, Vin Scully, Bob Melvin… literally thousands of people. But many fewer have been immortalized with a full-camo ATV bobblehead. That’s right. On May 28, 2016 the Braves gave lucky fans a bobblehead of Jones rescuing Freeman on his ATV. So today we celebrate the 45th birthday of Larry Wayne “Chipper” Jones, celebrity ATV snowstorm rescue-driver. There are probably not any icestorms or snowstorms in Georgia today, but we hope Jones goes out for a spin anyway. In his spare time, while not rescuing first basemen from frozen hellscapes, Jones was a pretty good ballplayer also. The 1990 first overall pick by the Atlanta Braves out of high school played his entire career for the Braves. He made his major league debut in 1993 at age 21. Though he came up as a shortstop and played some short and outfield during his career, Jones played the majority of his career and is best known as a third baseman. While Baseball Reference does not have this (surprisingly) as a split, his career OPS+ of 141 surely ranks first among ATV snowstorm rescue-drivers. Jones was an eight-time All-Star which, interestingly, did not include his one MVP year of 1999 when he slashed .319/.441/.633. Jones was a ballplayer who continued to play at a very high level late into his career. In fact, arguably his best offensive season came in his age 36 season in 2008 when he slashed .364/.470/.574 for an OPS+ of 176. 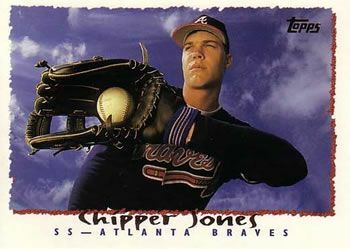 Jones was a part of some great Braves teams as they were in the postseason every year from 1995–the year he passed rookie-eligibility–through 2005. That rookie year of 1995 was the only year Jones won it all, as the Braves defeated Cleveland 4 games to 2 in the World Series. Chipper Jones’ Hall of Fame case seems quite solid, highlighted by his 85.0 career WAR which puts him 51st overall in baseball history for career WAR, and 32nd among position players. According to the JAWS Hall of Fame system (which averages a player’s career WAR with their seven-year peak WAR), Jones rates a 65.8, which is good for 6th all-time among third basemen. That is better than several current Hall of Fame inductees, including Brooks Robinson, Paul Molitor, and Ron Santo. The only question remaining in my mind: will Chipper Jones appear for his induction ceremony on an ATV?